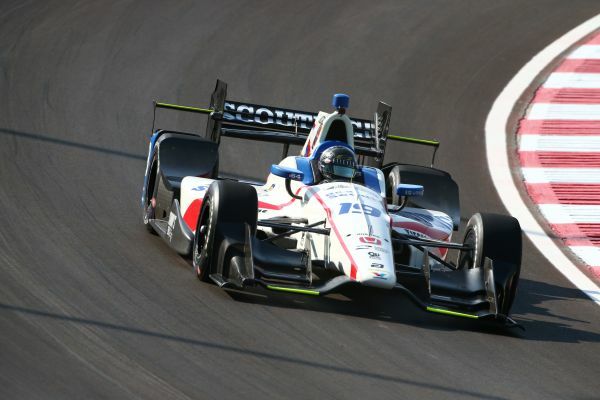 Ed Jones clinched the coveted Verizon IndyCar Series ‘Sunoco Rookie of the Year’ crown at Gateway Motorsports Park last weekend (25/26 August), courtesy of a hard-fought 13th-place finish in the Bommarito Automotive Group 500. The reigning Indy Lights Champion has enjoyed an impressive maiden campaign at the pinnacle of US open-wheel competition this year with Dale Coyne Racing, starring with a top three finish in the iconic Indianapolis 500 and invariably holding his own against rivals with far more experience than him – not to mention glittering career CVs. Jones continued to catch the eye by lapping fifth-quickest during free practice on his first visit to the 1.25-mile, egg-shaped Illinois oval. Although he found himself unexpectedly plagued by oversteer in the twilight qualifying session, 12th on the grid amongst the 21 high-calibre contenders represented a very solid starting position as the talented Dubai, UAE-born ace led the charge for DCR at an average speed of 182.9mph – outpacing the likes of heavy-hitters Graham Rahal and Ryan Hunter-Reay for good measure. The floodlit 248-lap race began under yellow flags following an early spin for one of Jones’ competitors, and once the action belatedly got underway, the 22-year-old Brit advanced a couple of spots. After threatening the top ten for a while, he ultimately took the chequered flag 13th as his 720bhp Dallara-Honda single-seater faded in the closing stages – but that was nonetheless enough to put the destiny of the ‘Rookie of the Year’ laurels beyond doubt. With no time to rest, Jones will return to the fray this coming weekend (1-3 September) for the IndyCar Grand Prix at the Glen – the penultimate outing on the fiercely-disputed series’ 2017 schedule. “After testing at Gateway earlier this year, I was really excited to go back for the race – they did a tremendous job to get the facility ready to welcome IndyCar,” praised the former European F3 Open Champion. “I really liked the track with the new surface; it’s smooth and a lot of fun to drive, and already one of my favourite ovals. “We knew the weekend might be a little challenging with our short oval aero package, but we had a solid first practice. Unfortunately, the conditions then changed significantly before qualifying with the drop in temperature, and that really made a big difference. We had a bit too much oversteer and I had to save the car from spinning a few times, which killed the speed a bit.